Anabaena St. Vincent ex Bornet and Flah: Nostocaceae. Blue-green algae. These algae are free-floating and do not produce visible strands or plant-like structures. 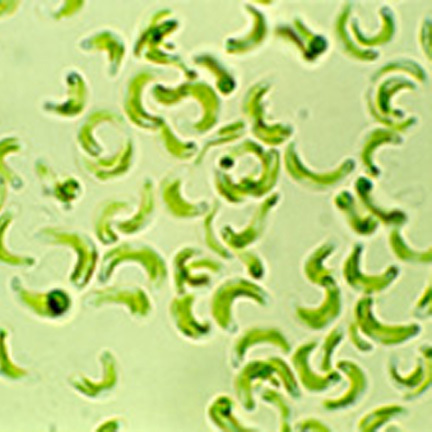 Under magnification the round green cells of Anabaena can be seen to join like beads on a string to form short unbranched chains, arcs or coils; larger clear cells intersperse with the more numerous small ones. These cells produce blooms that give areas of still water an evenly distributed pea soup-green color. At high densities, cells can aggregate into small, flattish, floating clumps or fragments that are visible without magnification. These floating pieces can coalesce to form scums (to 3 in, 7.5 cm, thick). Geosmin is a by-product of these algae; it creates taste and odor problems (earthy, grassy) in drinking water. Under certain conditions some species may produce toxins, such as anatoxins (alkaloid neurotoxins) and the hepatotoxic (liver-damaging) microcystins, reported to be fatal to animals. Blue-green algae. These species are single celled, cylindrical or rod-like to rectangular; found in water, on rocks and soil. They do not form colonies but the cells aggregate together in irregular clumps, within a slimy matrix. These aggregates may appear yellow or brown with age. Can cause taste and odor problems. May produce lipopolysaccharides capable of causing skin irritation and gastrointestinal distress. Chara L.: Muskgrass, stonewort, stinkweed. Characeae (stonewort family). Stoneworts. Found in slow-moving waters of lakes, ponds and streams; often in hard water. These algae grow submersed as upright, plant-like structures, 8 - 40 in (20 - 100 cm) tall, attached to the substrate by a root-like rhizoid (holdfast). The shoot has a sequence of whorls made up of 6 to 16 very slender linear structures that superficially resemble leaves or thin branches; these 'branchlets' are not further divided. Branchlets have short spines along their edges that help make the whole alga rough to the touch. An additional whorl of much shorter, downward-pointing fibers that resemble stipules may occur at the node. 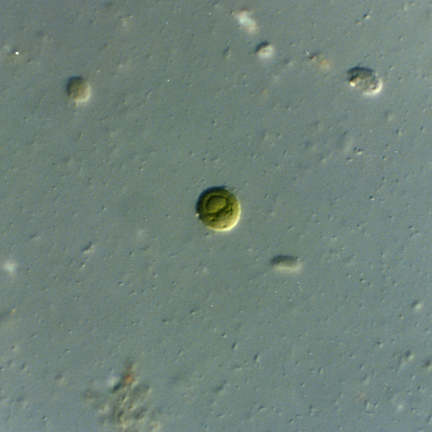 The branchlets may have small spherical reproductive bodies attached to them, but being algae, do not produce flowers. The whole structure often feels hard or stony due to the crust of lime (calcium carbonate) it can accumulate. Chara species contain sulfur compounds that produce a distinct garlic or skunky odor when the algae are crushed, unlike Ceratophyllum demersum or the other aquatic plants they resemble. 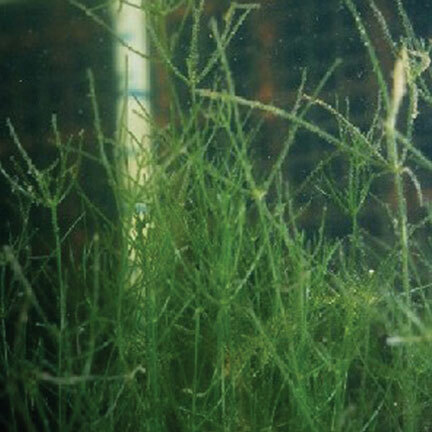 They can grow densely enough to cover the bottom of a water body and crowd out other vegetation. Green algae. 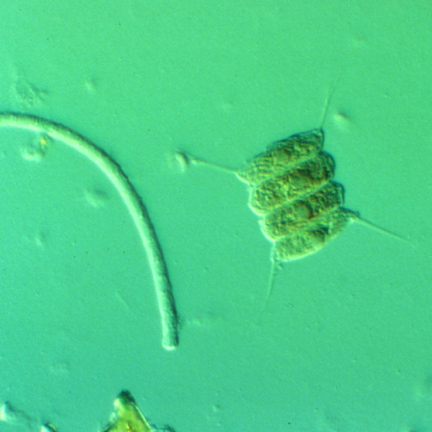 Single celled, round algae, free-floating and non-settling; found in pools and ditches. 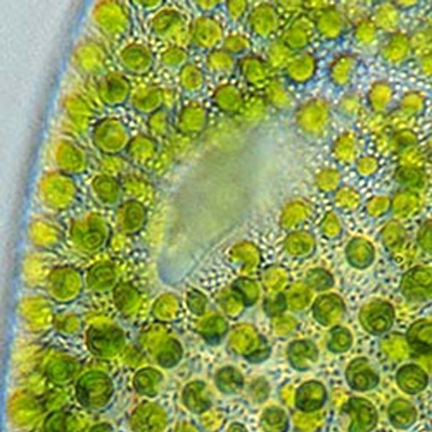 Each cell has a large cup-shaped chloroplast with a reddish eye-spot. There are two flagella, or whip-like "tails," per cell; these allow it to propel itself about and move towards areas of moderate light. These algae can cause taste and odor problems in drinking water. Green algae. 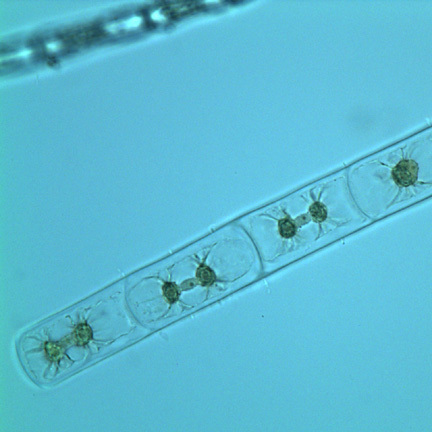 Microscopic, one-celled, spherical, free-floating and non-settling (planktonic) algae. The green chloroplast is carried against a side of each cell, filling half or more of the volume. Cells have no flagella or whip-like "tails," but although non-motile they can float freely or aggregate into clumps or can be found as "scum" on hard surfaces. Dense blooms of suspended cells produce green turbid water, creating taste and odor problems, usually described as musty. Very large populations are produced in waters with high levels of nutrients and organic material. Cladophora Kuetzing: Blanketweed, string algae. Cladophoraceae. Green algae. 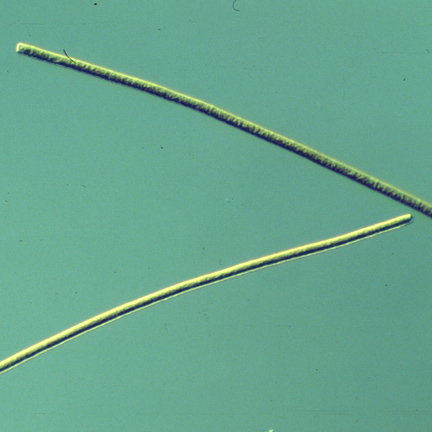 Common filamentous or thread-like algae made up of long chains of single cells that regularly branch or divide into two, as can be seen with magnification. Bright to deep green, they tend to grow in shallow, clear, nutrient-rich, hard water, attached to inert substrates or as free-floating and mat-forming colonies. They commonly attach to rocks or other hard substrates by means of a root-like holdfast, and are able to survive in fast-flowing water, often as strands up to 3.3 ft (1 m) long. These algae have no obvious mucilaginous coating and feel coarse, wiry, or springy; the filaments spring back when crushed in the hand, or spring out individual threads or strands when a mass is taken out of the water. They may feel rough or gritty due to build up of salts or accumulation of debris. Cladophora can be very problematic in cement-lined irrigation and drainage canals where they establish attached populations. When filaments die or break loose from their support they can compact together to form dense floating mats or rafts. Along shorelines or in open water these hinder swimming and fishing, and when mats decompose they lower oxygen levels in water and contribute to increases in bacteria counts. Green algae. 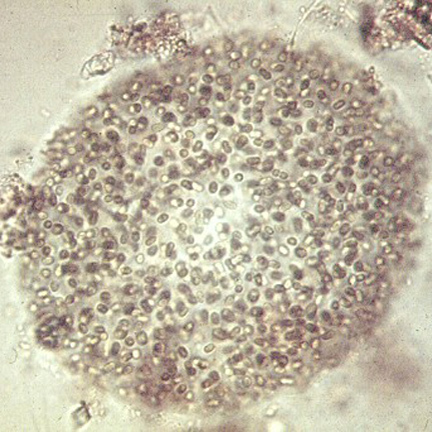 These algae occur in free-floating colonies that consist of a hollow ball of close-packed round cells, with from 8 - 128 cells per colony (always an even number). Under magnification it can be seen that the cells are joined together by short connections. The colony lacks any mucilage coating and does not have the ability to move on its own or propel itself. At lake edges, or floating in nutrient-rich lakes. Not usually found in high numbers but rather mixed in with other types of algae. Hydrodictyon Roth: Water net. Hydrodictyaceae. Green algae. Free-floating, net-shaped structures found in clear, slow-moving water; able to coalesce into mats. Individual cells, which can be up to 0.4 in (1 cm) long, are joined together in networks or meshes to form colonies that are flat sheets or hollow cylinders. The cylinders can be up to 8 in (20 cm) long and 2 in (5 cm) wide. The meshwork can be seen when algae are floating in the water or when an individual colony is picked up. Accumulations of the algae produce extensive light- to yellow-green mats at the surface; these can trap air bubbles and look frothy. When handled, pieces of the mat do not hold together but separate out into light, airy, or fluffy smaller masses or individual nets. Hydrodictyon can reproduce rapidly, with nets enlarging and increasing in number to nuisance levels in the course of a growing season. Mats hinder swimming and fishing and can be problematic in irrigation and drainage canals. 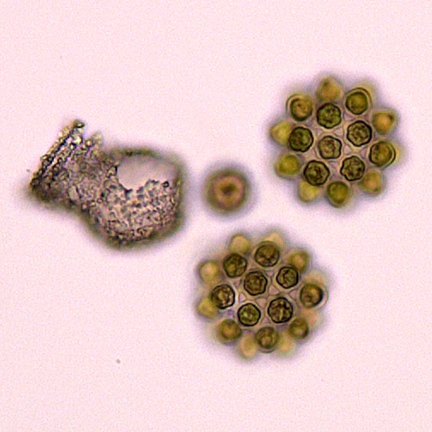 These algae are native to North America but in some places where they are introduced, e.g., New Zealand, they have become a major noxious weed. Nitella Agardh: Characeae (stonewort family). Stoneworts. Species vary in height from a few inches to over 3 ft (90 cm), and grow in shallow to deep water attached to the substrate. These bright green algae have a growth habit similar to an aquatic plant, with a slender upright stalk and whorls of linear structures that superficially resemble thin leaves or branches. In Nitella, unlike Chara, these branchlets can divide or branch again. Emerging downward from the branchlet whorl is another circle of shorter structures, resembling stipules. None of these structures have spines and the Nitella species do not feel rough; nor do they have the garlic odor or calcium deposits of Chara. 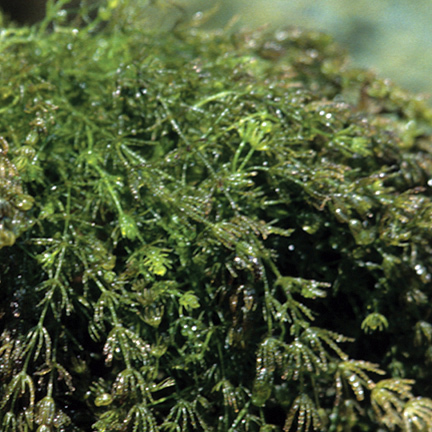 These algae form stands or lawns that seldom reach nuisance status. Green algae. Filamentous algae common in a wide range of water conditions, usually found growing attached to submersed plants or organic debris, as long strands or short fuzz. Some species create floating mats. The overall color ranges from dark green to yellow-green. Individual threads are made up of long cylindrical cells and do not branch. Under magnification, a ring or band is seen at one end of each cell, and rounded reproductive cells may be present. 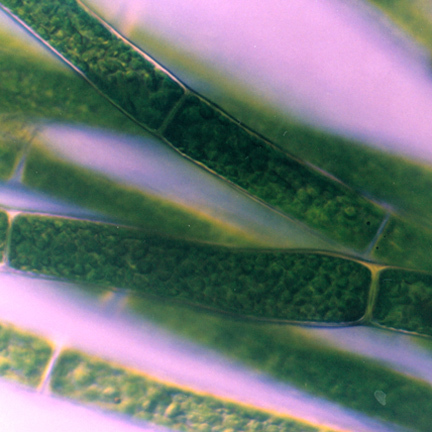 These algae are similar to Spirogyra, but the coarse strands making up the algal mass are tangled rather than parallel. Although the mucilaginous coating on the strands is apparent when they are rubbed, a mass of algae does not immediately feel slimy to the touch, nor slip from one's grasp. Can be abundant in stagnant, slow-moving water; hinders water flow in canals and ditches. Oscillatoria Vaucher ex Gomont: Oscillatoriaceae. Blue-green algae. Sometimes referred to as black algae. Filamentous, unbranched; can grow floating, or on soil, wet rocks, or in dense, dark blue-green clumps or mats at bottom of water body. These mats can be buoyed to the surface by gases produced by algal metabolism. Under the microscope the slender filaments are seen to be made up of disc-shaped cells, wider than they are long. The filaments twist and coil or sway slightly. These algae produce slime that allows them to glide along a surface but they are not surrounded by mucilaginous sheaths. In the field, new mats form when pieces detach and drift. Some species of Oscillatoria can cause water to be colored red or purple; some produce toxic compounds, including anatoxins, microcystins, and aplysiatoxins. These algae may also release geosmin and methlyisoborneol (MIB), chemicals that produce musty, grassy odor and taste problems in drinking water. Green algae. Free floating, non-settling algae that occur as groups of cells; widely distributed, often found among aquatic plants. 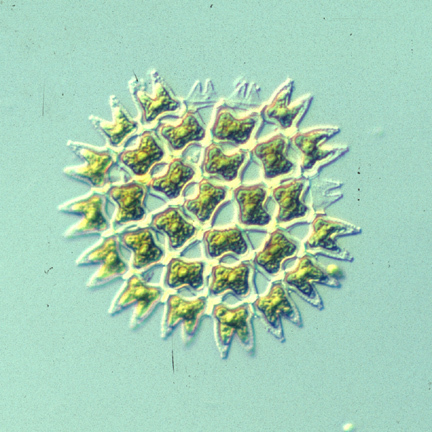 Under magnification these species can be seen to form flat, star-shaped colonies that are one cell thick. These colonies are made up of an even number of cells, from 4 or 6 to usually 64, sometimes 128, and the outer cells have projections or spikes. The colony does not have a mucilage coating. Individual cells are flat, with tough and durable cell walls. These algae are found in lakes and ponds and along shores, where water is rich in nutrients, especially nitrogen; they are rare in deep water. Can produce taste/odor problems in drinking water. 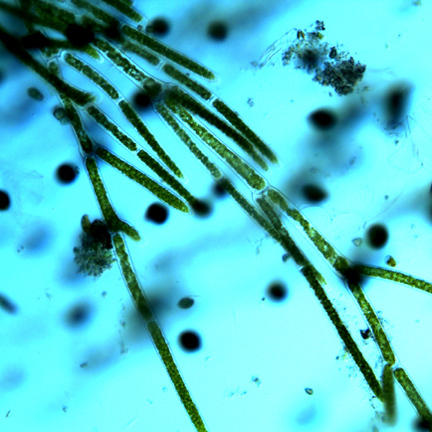 Pithophora Wittrock: Cotton-ball algae, horsehair algae. Cladophoraceae. Green algae. Free-floating algae that can coalesce to form larger units. Made up of coarse filaments that branch irregularly at right angles; these branches may divide once again. Individual filaments are visible without magnification. Under high magnification, barrel-shaped cells can be seen among the more common cylindrical ones. Algae float to the surface and are usually seen unattached to substrates; they form floating clumps up to 1 ft (30 cm) in diameter; these can be so numerous that they eventually cover acres of water. The color of the floating clumps ranges from bright to dark green; they often look brown or reddish due to the presence of dissolved iron. 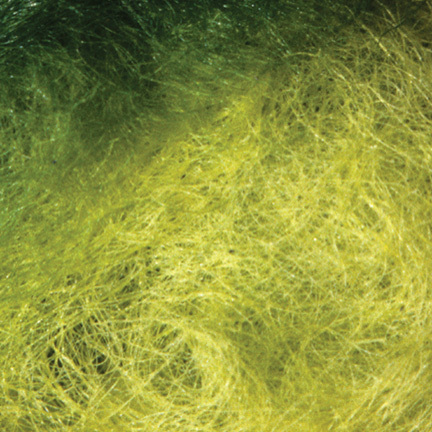 A mass of algae held in the hand is described as resembling a wet ball of cotton or a clump of horsehair; the branching, criss-crossing filaments are coarse and lack a mucilaginous coating, making the algae springy and resilient, and preventing the mass from being pulled apart easily. Since filaments do not align in parallel they do not form strands when handled. These algae can produce large infestations, covering areas of shallow water such as ponds, particularly in hard water that has high levels of phosphorous and nitrogen. Green algae. 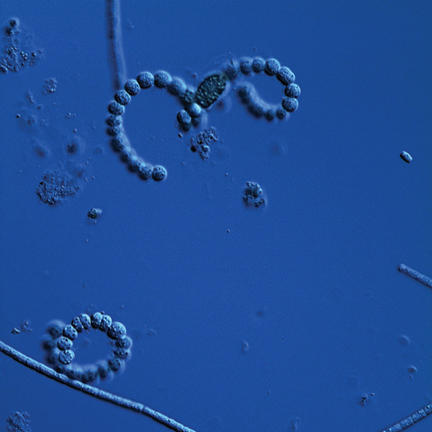 These are thread-like, mat-forming algae; they do not attach to a substrate. The slender filaments have almost no branching but may produce short lateral projections called rhizoids. Cells are 2 to 4 times longer than wide, seen under magnification. These algae form large tangled coarse mats or skeins that float near the surface, held up by the oxygen they produce, or snagged by underwater objects. Mats hinder swimming and fishing. 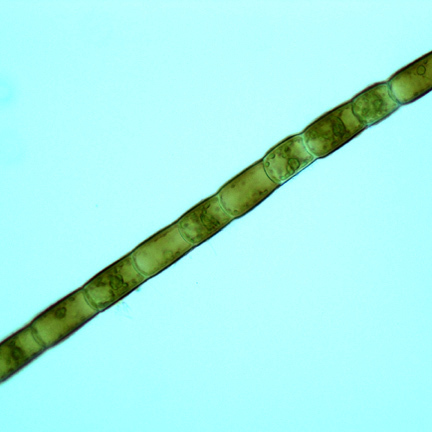 Generally found in shallow and hard water, Rhizoclonium grows in similar places as Cladophora, to which it is related. These algae are very problematic in irrigation and drainage canals where they may hinder flow. Geen algae. Very common free-floating, colony-forming algae. They are visible as a bloom, causing water of ponds and still, enclosed, areas to look bright green to grayish- or olive-green. They do not produce clumps, strands, or plant-like structures and usually do not form surface scums or films. Scenedesmus can be identified under the microscope as rectangular colonies of a few cells in multiples of two, usually from 2 to 8 (up to 32), that have joined together side by side in a single plane; they may have stiff spines on each "corner" but do not have flagella. Abundant in all water, especially where nutrients are high, and found floating among other vegetation. Blooms occur in response to high nutrient levels, most often at the end of spring and the beginning of summer. Can contribute to taste and odor problems in water. Green algae. Floating, colony-forming, non-settling algae. Magnification shows robust star-shaped colonies made up of from 2 to 16, crescent- or banana-shaped cells linked back-to-back at their centers. A single chloroplast is at the side of each cell, almost filling it. The colony may have a mucilage coating. Frequent in lakes, ponds, and swamps; often found with Scenedesmus, a related group. These algae contribute to pond scums. Spirogyra Link in C.G. Nees: Water silk, pond silk. Zygnemataceae. Green algae. Bright green filamentous algae; free-floating and able to form cottony brown mats of pond scum at the surface. Found in shallow, quiet to slow-moving waters; common in ditches and along shorelines. Individual threads are made up of cylindrical cells and rarely branch; they feel slimy due to a mucilaginous coating. These filaments grow parallel to each other, rather than crossed or twisted. When held in the hands the algal mass is slippery and untangled, able to be separated into long strings or strands. Colonies floating in colder, deeper water look cloudy or dispersed around the edges; in shallow, warmer waters the algae tend to form firmer growths and produce dense mats. Under magnification a green spiral is seen winding around the interior of each cell; this is a chloroplast in the shape of a helix. 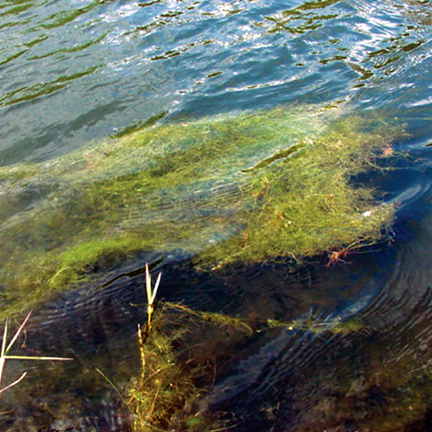 Mats hinder swimming and fishing; these algae can be very problematic in irrigation and drainage canals. Green algae. Filamentous, often found along with Spirogyra in still water. These algae are made up of very long unbranched threads that have a slimy coating; they feel slippery when picked up. Looks yellow-green when under water. 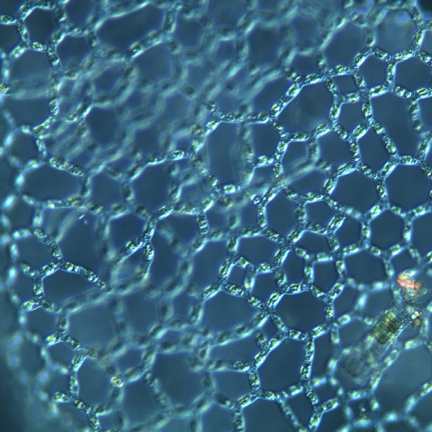 With magnification two green star-shaped structures can be seen in each cell; these are chloroplasts.